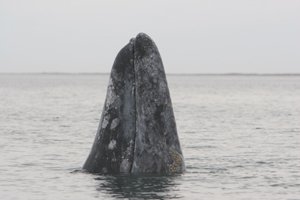 Atlantic Gray Whale on the Move?....UPDATE! ......"Last month, a gray whale was photographed in the eastern Mediterranean (the first recording of this species in the eastern Atlantic in some 500 years), and probably represented an animal from the eastern Pacific stock which got lost and ended up in the Atlantic. This animal now seems to be on a northward migration (it was recently seen off Barcelona, Spain having travelled some 3,000 km in 23 days) and depending on its exact route, it is likely to move out of the Mediterranean, up coastal waters of western Spain and Portugal and possibly as far north as France, Ireland, the UK, or the North Sea over the next month or so. Therefore, I would be grateful if anyone doing cetacean surveys over this summer keeps a special eye out for a medium sized whale, lacking a dorsal fin and with a mottled grey skin colour. It is likely to lift its tail into the air on diving." ....Photographs of the underside of the tail as it dives would be required to show that it is the same individual as seen in the Mediterranean. If there are any possible sightings, please take a photograph and do let the IWDG know as soon as possible of any encounters you may have with this animal. "On 30th May 2010, at 16:30h an unusual sighting of a gray whale in front of the Barcelona harbour (41º20'79'' N Long 2º11'72''E ) was confirmed (Image below). The whale was consistently heading south at slow pace. The sighting was confirmed by members of SUBMON, an NGO dedicated to develop studies related to the conservation and assessment of marine habitats. Pictures from this sighting were compared by the ones taken by Aviad Scheinin from IMMRAC on May 8th 2010 in Israeli waters by Manuel Castellote at the National Marine Mammal Lab (AFSC-NMFS-NOAA) confirming the matching, indicating that the same individual travelled from Israel to Spain in 23 days, a distance of almost 2,000 miles, or almost 85 miles per day. This is the first time that a gray whale has been sighted in the western basin of the Mediterranean Sea and just the second time that's it is reported in the whole basin. Taking into account the relevance of this sighting, SUBMON is coordinating the effort to re-sight the whale in Spanish waters in order to assess his health condition, reduce collision risks with vessels and obtain a biopsy sample of this individual to determine its population identity." Having received an email from Dr Owen Nevin Ctr. for Wildlife Conservation, National School of Forestry, University of Cumbria, we can thankfully rule out the possibility of this animal being re-located into the Atlantic, as was mooted a few years back. So at least we are certain that it arrived in the Eastern Med under its own steam. Daphna Feingold, SeaWatch Foundation, who hails from this region and is in contact with IMMRAC researchers, says .... "The whale was sighted another few times by members of the public and fishermen since its initial sighting", but fears that it may not survive as it will have a very hard time finding food resources in the Mediterranean, especially the Eastern part. Many questions remain.....Is this a solo pioneer?